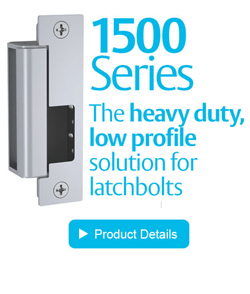 The HES 1500 Series electric strike is more than a new heavy duty, low profile solution for latchbolt locks. It accommodates every brand of cylindrical or mortise lock designed to work with a 4-7/8″ strike plate. 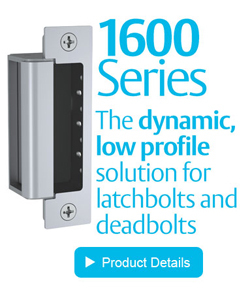 The HES 1600 Series heavy duty electric strike is the most advanced electric strike available on the market for cylindrical latchbolt and deadbolt locks. It accommodates up to a 1″ deadbolt with enhanced vertical cavity spacing and will accommodate every brand of cylindrical or mortise lock designed to work with a 4-7/8″ strike plate. The HES 1500 and 1600 Series Electric Strikes set a new standard in the industry by offering dynamic integrated adjustability and field configurable options compatible with any cylindrical or mortise lock. The modular design of the platform makes stocking and installing easier with interchangeable faceplates and accessories. For the first time, the aesthetics of an electric strike are complimentary to other surrounding door hardware and blend in with the opening due to the fully finished design available in seven finishes.